Who next for Manchester United after Chelsea agree Pedro deal? Would Manchester United move from Thomas Muller (left), Zlatan Ibrahimovic (centre) or Karim Benzema after missing out on Pedro? Manchester United's lengthy pursuit of Barcelona's Pedro has ended with the Spain star heading to Chelsea in a £21m deal. The 28-year-old who has won the Champions League three times with Barcelona looked destined for Old Trafford when United's executive vice-chairman Ed Woodward headed out to Spain in the hope of finalising a deal. Instead, with Chelsea making their move and United manager Louis van Gaal reportedly having misgivings about the transfer, Pedro flew into London to sign for Chelsea. United coveted Pedro for a lengthy period - so where do they go now after seeing the gifted product of Barcelona's La Masia academy prepare to sign in at Stamford Bridge. Have United lost some pulling power? Manchester United like to label themselves as the biggest club in the world - this does not seem to be a view shared by the many elite players in the current era. Under Sir Alex Ferguson, ably assisted by David Gill, United had an excellent success rate in pulling off the big deals when they needed them. There were occasional misses, such as when United could not close a deal for Brazilian superstar Ronaldinho, but plenty of hits too. Since Ferguson's departure, and Gill's replacement with Woodward, United's interest is no guarantee of getting a deal over the line. Pedro may not have actually been a priority signing but it will be a blow to United's giant ego and profile that it will be perceived he has snubbed them for Premier League rivals Chelsea - a fate they appear likely to suffer even more starkly if long-time defensive target Nicolas Otamendi moves from Valencia to Manchester City as expected. It also appears United were the collateral damage for Premier League champions Chelsea's painful start to the season, the instant reaction to Sunday's 3-0 loss at Manchester City being the deal to sign Pedro. This all comes hard on the heels of the lengthy courting of Real Madrid's Sergio Ramos, who was first the subject of a £28m offer that had no chance of being accepted, then a potential exchange with goalkeeper David de Gea. The suspicion among outsiders was that United were simply being strung along before the Spain defender signed a lucrative new deal at the Bernabeu - suspicions confirmed when he signed a five-year contract. It was a pattern that first emerged when David Moyes succeeded Ferguson as manager and proposed deals for Everton's Leighton Baines, Cesc Fabregas (who moved from Barcelona to Chelsea) and another former Barcelona player Thiago Alcantara, who went to Bayern Munich, were among those that failed to materialise. For all United's global fanbase, their mixed recent transfer record is proof that they are now back among the pack when it comes to the world's top clubs, even when it comes to competing with domestic rivals such as Chelsea and Manchester City. It may be a tough message to take - but one that is supported by hard evidence. Pedro would have been a fine addition to United's squad, a player of proven pedigree with an attitude that has drawn lavish praise from the likes of his former Barcelona coach Pep Guardiola. The sight of him being paraded in a Chelsea shirt will be a disappointment - but was he actually a top priority? The answer to this is probably "no", which may have contributed to United becoming less enthused about the deal, although the change of mind appears to have been very sudden. There were also claims Pedro had been put off the switch by Van Gaal's public sidelining of his former Barcelona team-mate, goalkeeper Victor Valdes. United's priority must surely lie in securing another striker. For all Van Gaal's positive talk resources behind Wayne Rooney look mighty thin and must be addressed with the acquisition of quality. It would be high-risk to start the season relying so heavily on Rooney, backed up by Javier Hernandez, who has barely seen action under Van Gaal, and youngster James Wilson. Van Gaal may shuffle his resources but the bottom line is United need a high-quality addition in that area to fill the vacancy left by Robin van Persie's departure for Fenerbahce. And with Ramos staying at Real and Otamendi seemingly heading for Manchester City, United may also feel the need to make additions in central defence. Chris Smalling has been outstanding so far this season but Phil Jones has not kicked on while Jonny Evans appears surplus to requirements. Paddy McNair and Tyler Blackett are still making their way at Old Trafford. Marcos Rojo is also in the squad but Van Gaal may need more. Van Gaal must also address the unsatisfactory situation of having a world-class goalkeeper like De Gea sitting in the stands cutting an increasingly isolated figure - this is surely unsustainable. United may play hard ball with Real Madrid in this deal but it must be cleared before the deadline. Is there really any mileage in keeping a clearly discontented player for a whole season then face the grim prospect of seeing him walk away for free next summer? 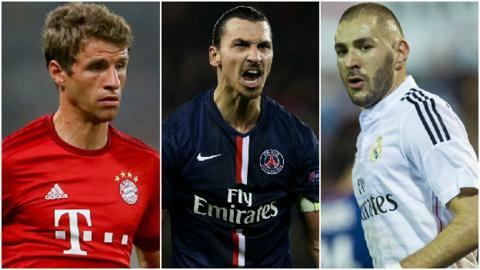 Who next for Man United? Manchester United have been busy in the market this summer bringing in the likes of Memphis Depay, Morgan Schneiderlin, Bastian Schweinsteiger and Matteo Darmian - but this is not enough to give them the appearance of Premier League title challengers or Champions League contenders. So who might be next on the hit list? They have already made a move for Southampton's Senegalese winger Sadio Mane. It is understood United made a bid for the 23-year-old last week, although Saints have denied receiving one. A striker is a must and United have long been linked with a £40m interest in Tottenham's Harry Kane. The problem here is that Spurs have no intention of selling a player who has become a symbol for the future at White Hart Lane and the 21-year-old England striker has no wish to leave. There may be other options available. Karim Benzema has been linked with a move away from Real Madrid all summer, with Arsenal heavily linked, while there is every chance Edinson Cavani could be prized away from Paris St-Germain. Both would fall into the £50m bracket but United would be happy to make such an ambitious statement if the deal could be done. PSG's Zlatan Ibrahimovic has been making noises about leaving and if ever a player had the charisma and confidence to feel at home at Old Trafford it is the world-class Swede. United have also been touted as potential suitors for Bayern Munich's £60m-rated Thomas Muller but rather like the Ramos deal this sounds like one that would fall into the "believe it when you see it" category. It is easy to criticise United's failure to get the deal over the line but perhaps Van Gaal saw what was coming, felt priorities did lie elsewhere and pulled back at the last-minute. Perhaps memories of the dismal failure of £59.7m Angel Di Maria were too fresh to take the plunge on a deal he had doubts about. It certainly does not appear money was the problem as far as this deal was concerned but there is no doubt United will face criticism, and perhaps a little embarrassment, when Jose Mourinho and Chelsea parade their new prize. And, most importantly of all, there is still plenty of time left in this transfer window to make more of the sort of deals they need - final judgement must be reserved until then.